Finally a tool rest that will keep up with your imagination & creativity! 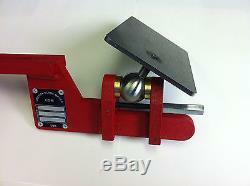 Solid steel ProRest with ball clamp to offer virtually unlimited grinding angles, opening up new creative parameters. 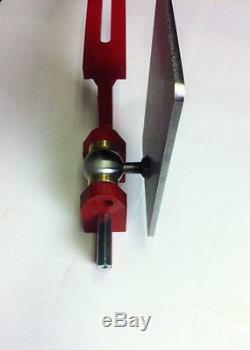 This rest bolts directly onto a 1.5"x1.5" tooling arm & is for exclusive use with grinders that accept such tooling arms. The slot allows it to be moved closer to or further away from the grinding belt. Rock solid platform is locked in place via the unique ball clamp & solid brass bushings, use a 7/16 wrench or ratchet/socket to secure. The platform measures 6.5"x4" & once secured is almost impossible to move. Grind vertically or horizontally & everything in between. Saves you tons of time! Works with flat platens, slack belts, rubber wheels & small wheel sets. Built to last a lifetime. 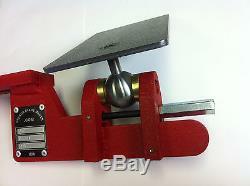 The item "Knife Making Tool Rest for 2x72 knife making belt grinder suits ALL WHEELS" is in sale since Friday, July 31, 2015. This item is in the category "Home & Garden\Tools & Workshop Equipment\Power Tools\Grinder Wheels & Accessories". 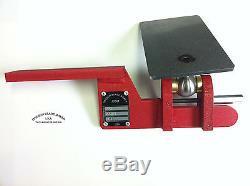 The seller is "originblademaker" and is located in Hillsboro, Oregon. This item can be shipped to United States, Canada, United Kingdom, Denmark, Romania, Slovakia, Bulgaria, Czech republic, Finland, Hungary, Latvia, Lithuania, Malta, Estonia, Australia, Greece, Portugal, Cyprus, Slovenia, Japan, China, Sweden, South Korea, Indonesia, Taiwan, South africa, Thailand, Belgium, France, Hong Kong, Ireland, Netherlands, Poland, Spain, Italy, Germany, Austria, Israel, Mexico, New Zealand, Philippines, Singapore, Switzerland, Norway, Saudi arabia, Ukraine, United arab emirates, Qatar, Kuwait, Bahrain, Croatia, Malaysia, Brazil, Chile, Colombia, Costa rica, Dominican republic, Panama, Trinidad and tobago, Guatemala, El salvador, Honduras, Jamaica, Antigua and barbuda, Aruba, Belize, Dominica, Grenada, Saint kitts and nevis, Saint lucia, Montserrat, Turks and caicos islands, Barbados, Bangladesh, Bermuda, Brunei darussalam, Bolivia, Ecuador, Egypt, French guiana, Guernsey, Gibraltar, Guadeloupe, Iceland, Jersey, Jordan, Cambodia, Cayman islands, Liechtenstein, Sri lanka, Luxembourg, Monaco, Macao, Martinique, Maldives, Nicaragua, Oman, Peru, Pakistan, Paraguay, Reunion.